Last year, Penn State’s Dance Marathon Alumni Interest Group (DMAIG) contacted us with questions about creating an interactive fundraising campaign. They were looking for a way to rally support for the Penn State Dance Marathon (THON) and their efforts to stop childhood cancer. The plan was to have the final photo mosaic printed and displayed at PSU main campus. It didn’t take long for our team to recommend our online & social interactive mosaic platform. 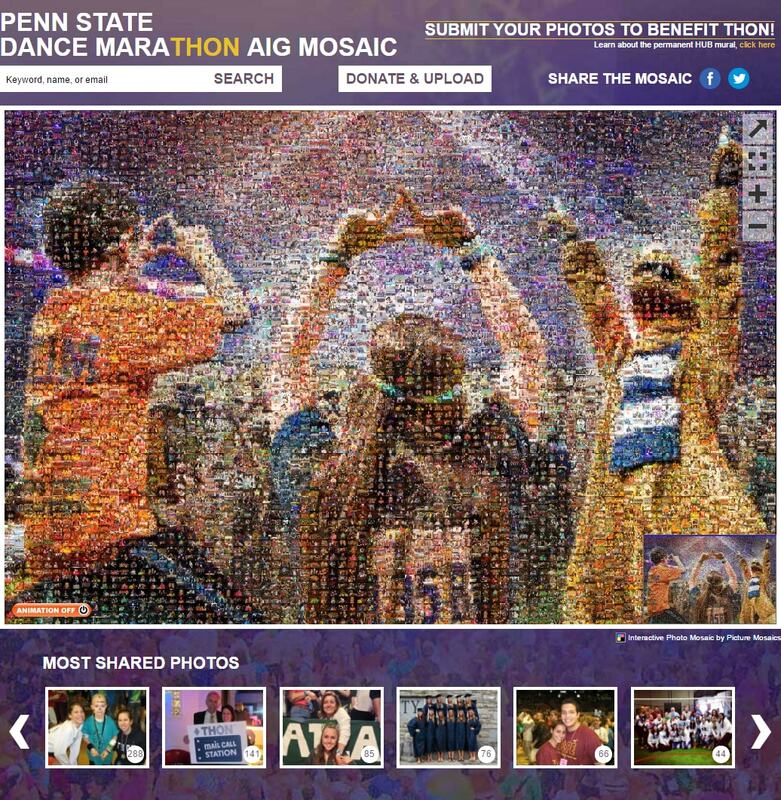 This entry was posted in Fundraising, Mosaics, Murals, Online Interactive Photo Mosaics, Photo Mosaics and tagged DMAIG, fundraising, Penn State, THON on February 24, 2017 by Robert DeCarolis. As Barack Obama’s historic presidency came to a close, GIPHY, Deep Focus, and Now This contacted us to help them devise an interactive experience for Obama’s fans to say thank you. The goal was to allow each supporter to show their appreciation, while coming together as a whole to say “Thanks, Obama” in what will be the largest digital standing ovation in history – #TheStandingO. 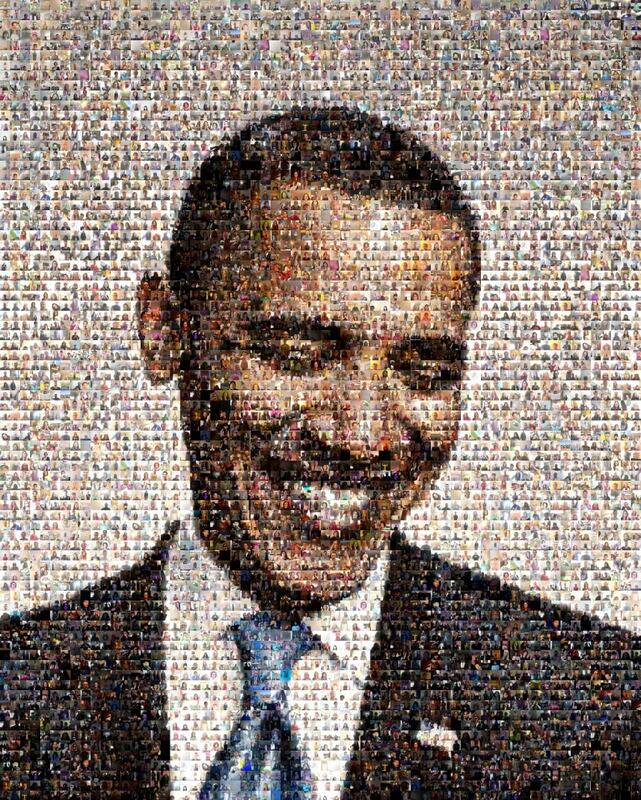 This entry was posted in Mosaics, Online Interactive Photo Mosaics, Photo Mosaic Software, Photo Mosaics, Video & Animation and tagged Barack Obama, Deep Focus, GIPHY, Now This, presidents on February 23, 2017 by Robert DeCarolis. On an average day, 60 million uploaded photos and 1.6 billion likes occur on Instagram. But how can you use these photos to your advantage? Hashtags can generate vast, online conversations or compile a live photo album of your event. In fact, studies show that simply using a hashtag can double a post’s engagement. This entry was posted in Events, Live Print Mosaics, Mosaics, Murals, Photo Mosaics and tagged event mosaics, hashtag mosaics, live print mosaics on February 13, 2017 by Robert DeCarolis. Did your picture make our list? We’ve gone through the thousands of picture mosaics created by our Online Mosaic Tool throughout 2016, and selected the most viewed from each popular category. Check out the winners below! This entry was posted in Mosaics, Photo Mosaic Software, Photo Mosaics, Photography and tagged baby, family, mosaic, pet, wedding on February 13, 2017 by Kim Babula.